WESLACO — A preliminary assessment by the National Weather Service estimates the Rio Grande Valley sustained $100 million in damages as a result of flooding last week, Hidalgo County Precinct 1 Commissioner David Fuentes said Saturday at a multi-agency news conference here at city hall. At the first news conference since thunderstorms and showers ravaged the county with upward of 15 inches of water in four hours on Wednesday, county and local officials provided an update on their coordinated efforts, which will soon be focused on recovery. 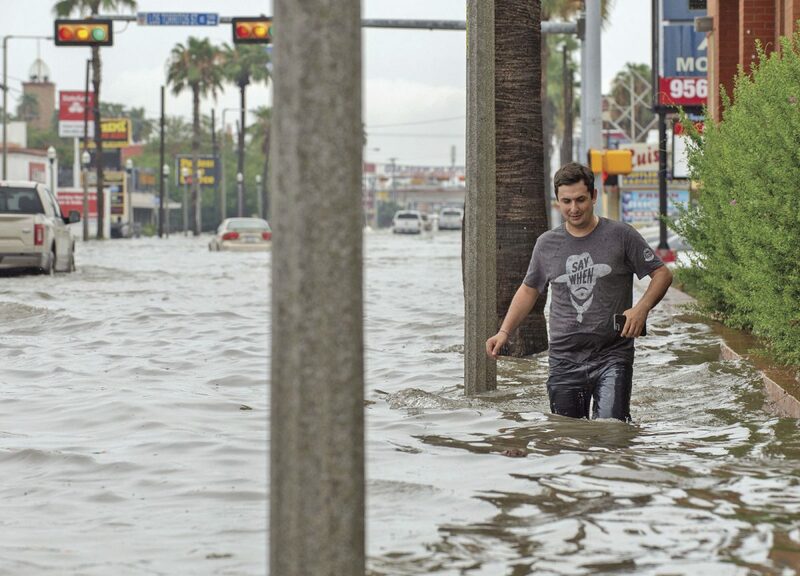 In Weslaco alone, a preliminary damage assessment by the city found 1,944 homes and about 97 businesses were flooded with more than 18 inches of water, according to city Emergency Manager Antonio Lopez. It’s currently unclear how many homes and businesses were flooded in the county altogether. Hundreds of occupied homes still remained flooded on Saturday. A handful of residents from flooded areas also attended the news conference to hear about drainage, rescues, coordination and resources. Some community members asked city and county leaders to focus on their neighborhoods, like the Las Brisas subdivision on the northeastern portion of Weslaco. In response, Lopez, who also serves as the city’s fire chief, explained that a new tactic, pumping water both upstream and downstream simultaneously, would drain flood water faster. Lopez and Hidalgo County Drainage District No. 1 General Manager Raul Sesin reiterated that drainage and infrastructure worked as designed, despite concerns from residents who have turned their attention to infrastructure. Floodwaters in the western part of the county were directed to the eastern side through the vast drainage system, which eventually spills the rainwater into the Laguna Madre. “Our system was trying to handle about 35 inches in two days,” Fuentes said. 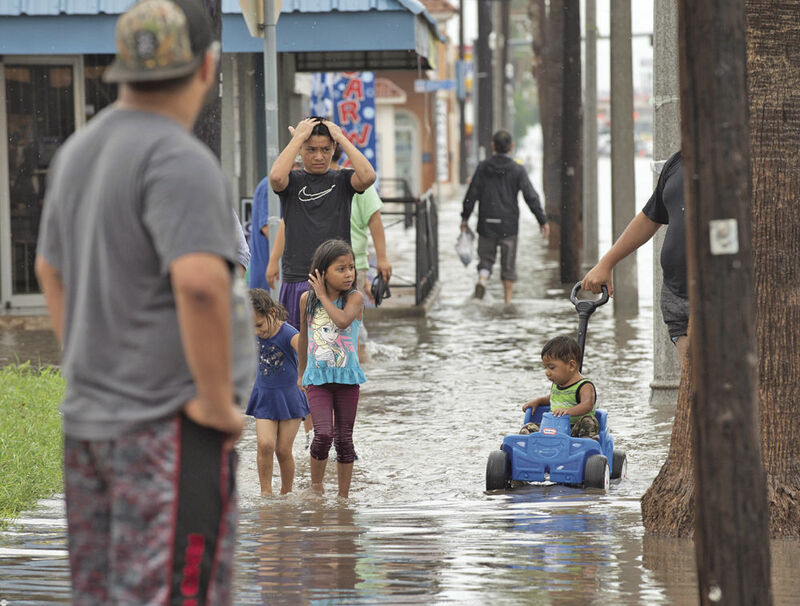 Palacios committed to focusing county resources on the most heavily impacted areas, likely in Precinct 1, which includes Mercedes and Weslaco, two cities still inundated by water as of Saturday evening. 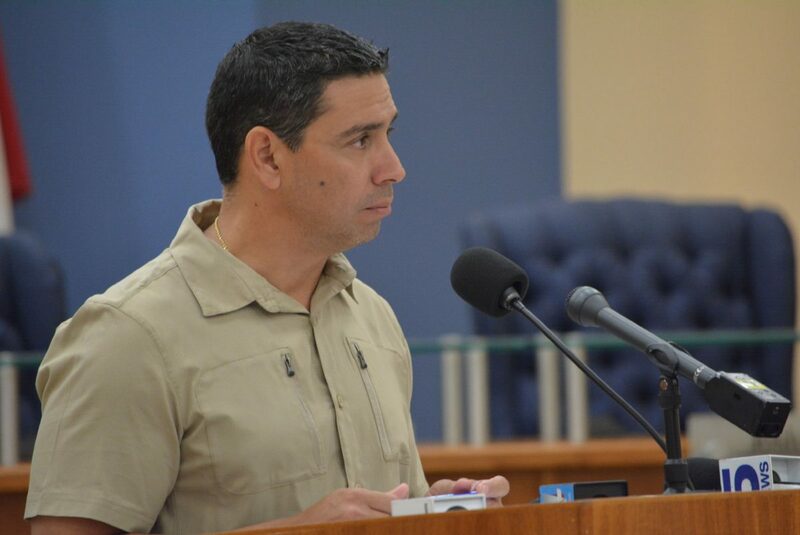 In addition to commissioners, the head of Hidalgo County Health and Human Services, Eduardo Olivares, urged residents to avoid walking through floodwater, which may be contaminated with sewage from septic tanks or other potentially harmful substances. The county, he said, will also direct efforts to control the mosquito population to prevent the spread of Zika, Chikungunya and West Nile. Sen. John Cornyn, R-Texas, visited the Valley on Friday to tour immigrant detention centers and joined a roundtable discussion at the U.S. Border Patrol station in Weslaco before heading to the Mid-Valley airport to catch a fight, where Fuentes and Palacios spoke with him about the need for a federal disaster declaration as well as funding for drainage infrastructure. The Raymondville Drain and the Delta Water Reclamation projects will help push floodwater into the Laguna Madre expeditiously, and county leaders and congressmen have been coaxing state and federal leaders to allocate funding for the two projects. The Raymondville Drain, which local leaders broke ground on late last year, would cost an estimated $400 million, most of which has not yet been funded, The Monitor previously reported. Also on Friday, U.S. Rep. Vicente Gonzalez, D-McAllen, sent a letter to President Donald Trump also advocating for an immediate disaster declaration and requesting he “make resources, including federal funds, available” to Hidalgo, Cameron, Willacy, Aransas, Nueces and San Patricio counties. Damage to public property also includes the Precinct 1 office, now temporarily closed due to a foot on water inside the offices on Joe Stephens Avenue near Weslaco. Precinct 1 workers are stationed at Weslaco City Hall, and Fuentes said his office will likely be working out of the Progreso Community Resources Center for a couple of months, until flood damage is assessed and repaired. County crews began documenting the extent of the damage to public and private property by taking drone footage and on-the-ground photographs for evidential purposes, according to Fuentes, who said the county works to estimate the extent of the damage in order to meet requirements for a disaster declaration by the federal government. Local, county and state officials now look to Trump, who has the power to declare a state of disaster, which would trigger federal assistance through the Federal Emergency Management Administration. “We’re hopeful that the president and his departments (will) get that done,” Fuentes said.